(1)	objective of this study Although Laparoscopic assisted gastrectomy (LAG) is has been accepted procedure for early stages of gastric cancer, the morbidity and modality are not clear compared to open gastrectomy (OG). We show our patientsf prognoses after LAG. This is a retrospective and single facility report. (2)	methods and procedures We have performed 76 LAG and 94 OG cases of clinical StageIA and IB early gastric cancer from January 1999 through December 2005. Follow-up terms were from 2years and 8maonthes through 5 years. Total gastrectomy were not included. The exclusion criteria specified cancer suitable for Endoscopic mucosal resection (EMR) or endoscopic submucosal dissection (ESD). (3)	results No statistical significances between LAG and OG patients about their backgrounds (age, gender), major morbidity and mortality. The details were 51 male, 25 female for LAG, and 68 male, 26 female for OG. The mean ages were 55.6 years of LAG and 58.7 years of OG. In LAG group, three cases were converted to open surgery. The reasons of the conversion were tumor advances for two cases and intra-operative hemorrhage for one case. The severe morbidities and mortalities were observed in 12 LAG cases; one small bowel obstruction, one multiple liver abscess, one cancer incidence of the remnant stomach, one death caused by cancer recurrence, 6 cases of other organ cancer incidences and two death cases of other organ cancer. For OG group, 16 cases were observed; one small bowel obstruction, one cancer in the remnant stomach, one death caused by cancer recurrence, 10 cases of other organ cancer incidences and three death cases of other organ cancer respectively. 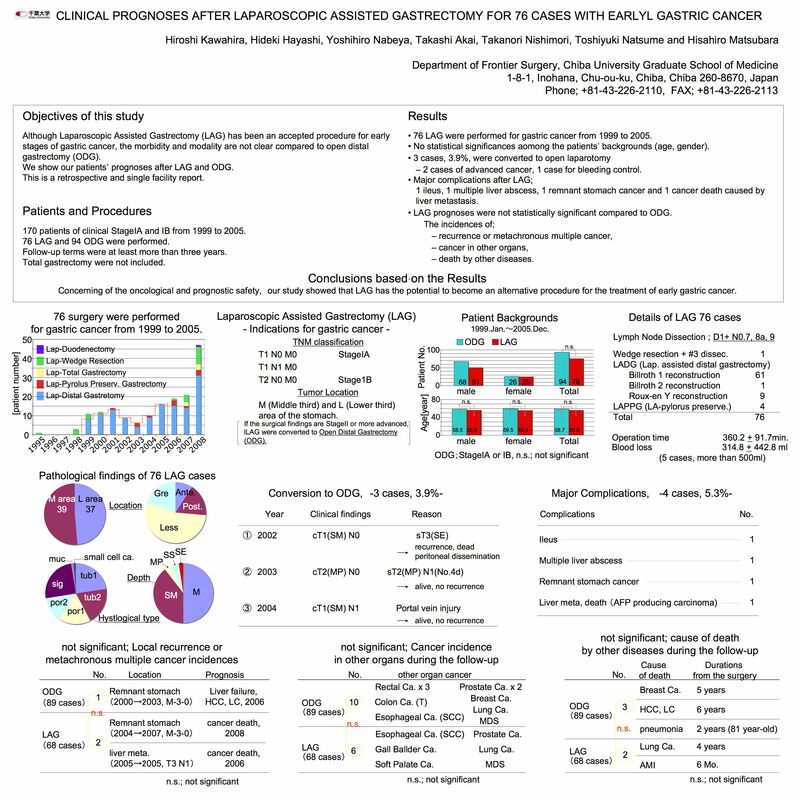 (4)	conclusions based on the results We could not prove the statistical significances concerning the oncologic safety of the laparoscopic approach to gastric cancers. A follow-up term of at least 5 years is essential for a reliable estimation of recurrent disease, and the number of patients enrolled did not confer enough statistical power for the detection of small group differences in survival.